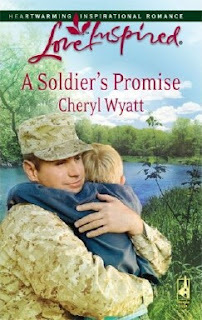 Today, I'm thrilled to post an interview with my friend and fellow author, Cheryl Wyatt! Her debut novel, A Soldier's Promise, just released this month! "My name's Bradley. I'm eight and have cancer. I want to meet a Special Forces soldier more than anything. Well, almost anything. Having a family would be nice." U.S. Air Force pararescue jumper Joel Montgomery promised to make a sick child's wish come true. Well, not the family part—not with Joel's past. And so despite vowing never to set foot back in Refuge, Illinois, Joel parachuted onto the boy's school lawn to a huge smile. But another smile unexpectedly stole Joel's heart: that of Bradley's beautiful teacher, Amber Stanton, who was trying to adopt the boy. And trying to show Joel it was time for new vows. And now, here's me and Cheryl! ’Fess up. Who is your favorite PJ? This is so hard! Making me choose just one? LOL! That's like asking me which of my children are my favorites. Okay...here goes. Joel-because he's such an honorable leader and because he launched my fiction career. I do believe with all my heart that his character is one of the main reasons they contracted me. Manny-because he's not afraid to tell his friends the truth about themselves, even when it makes them mad. Nolan-because though he's brave and fearless and uber tough, he's not afraid to show compassion. Vince-because he's such a hot head and Harley-riding bad boy who broods with resistance to God and is so stubborn about Christianity. But wait until God and I redeem him!!! Chance-because he loves his sister so much and who can resist his trademark lopsided grin? Brockton-because he's just so funny in his country-boy ways, and his mannerisms are cute in an alpaca kind of way. Ben-because he'll do anything to help a friend in need. Petrowski-because he reminds me of the secretive "Charlie" from Charlie's Angels...you never see him onscreen but he's a force to be reckoned with or reconned with...depending on the "situation" at hand. LOL! If A Soldier’s Promise were made into a movie, which actors would you want to play Joel, Amber, and Bradley? Joel would be played by George Eads, who played Nick on CSI. 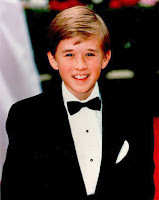 (see pictures) Bradley would be played by an eight-year-old Haley Joel Osment (boy actor in Pay it Forward and The Sixth Sense). Amber would be played by a red-headed Julia Roberts as she looked in Erin Brockovich with her wild curls. If your children were desserts, what would they be and why? Magnum would be an over baked cookie because she's really tough and hard-willed. LOL! Eno would be an elaborate neon green and purple spaceship-decorated cupcake because she's so creative and usually off in her own world and tends to dress and act eccentrically. LOL! Randa would be a miniature rich chocolate cupcake with hot fudge icing with Red Hot candy sprinkles because she's tiny and cute and sweet yet hot tempered. LOL! If your guinea pigs were characters, what would they each be like? Marshmallow would be a totally lazy couch potato dad with remote in hand and shades over his eyes so people would think he's actually watching TV instead of snoozing. Kind of like my husband as far as being so laid-back he's horizontal. Brownie would be in rehab from overdosing on betacarotine. He's seriously addicted to carrots and will actually try to chew through a metal cage if he smells one from the other room. If someone opens the fridge and does not bring him a carrot, he will turn around and press is bottom against the cage and either shoot poop pellets as far as he can. Or kick his back legs similar to a horse bucking and fling and flip all of his bedding out of the cage onto the floor. S'more would be a docile, clumsy Mr. Magoo with a mouth harness. He can't see well so he always bites fingers when being fed. He has issues with depth perception and is always running into the wall of the house instead of the door, and is always missing the water bottle tube when drinking. He also walks into things in his cage. "....Ahh (laughs) could think of several things (more laughing) but is not sure he should put it on paper...He could tell ya but then he'd have to kill ya and he couldn't have any witnesses so he better not say." Camy here: Thanks a bunch, Cheryl!